London is The Perfume Society‘s home turf and what better way to explore Blighty’s capital, than shopping for a new smell in some of the word’s most fabulous fragrance shops. 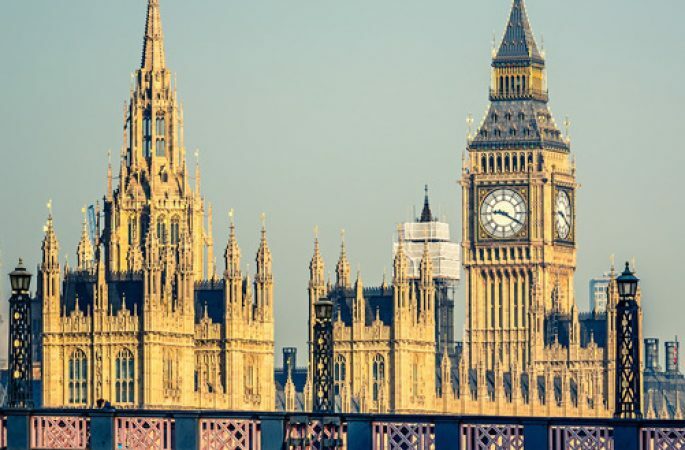 This guide provides you with plenty of options, whether it’s central London you want – with famous department stores like Selfridges and Liberty London standing tall – or you fancy venturing East for some quirky, niche boutiques situated on London’s trendiest streets. Heading south? Find details below for Roullier White, nestled in leafy East Dulwich and well worth the treck. 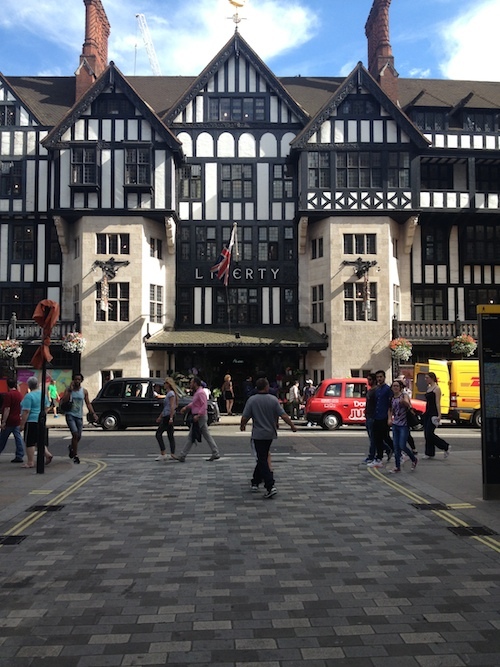 Liberty offers one of the most joyous shopping experiences in London: a stately Tudor-style, panelled building with numerous rooms brimming with an eclectic mix of luxurious and innovative products awaiting discovery – like a true bazaar. The Liberty Perfumery, originally created and curated by The Perfume Society’s own Lorna McKay, has a well thought-out edit of fragrant delights: exclusive-to-Liberty Byredo from Sweden, Le Labo (on-the-spot perfume mixologists), and Frederic Malle: road-test his ‘smelling column’, a futuristic design for you to smell individual fragrances without intrusion from the open air. Inside the tapestry walls of the perfume room itself, heritage and contemporary perfumes are displayed side by side. 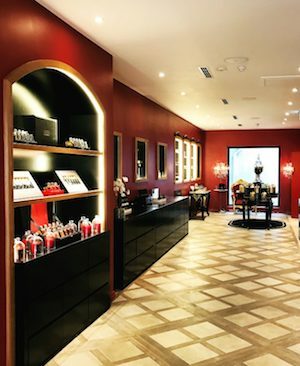 Creed, Escentric Molecules, Odin, Annick Goutal, Serge Lutens, Richard E. Grant’s Jack, Etro, Ulrich Lang… And a must-see – placed between the Perfume and Chocolate rooms, the not-to-be-missed Diptyque boutique. 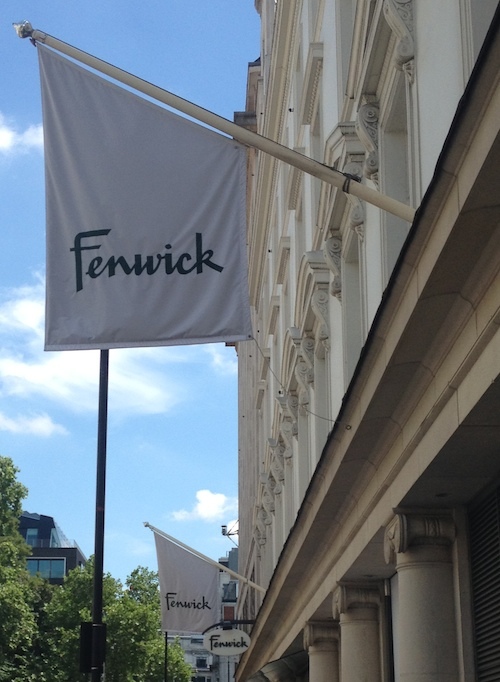 Having had a so-glamorous makeover in the last couple of years on the fashion floors and with a stunning newly-relocated-to-the-Ground-Floor Shoe Corner, Fenwick is now turning its attention to fragrance. Offering an increasingly intriguing selection of brands, including Annick Goutal, Olfactive Studio, Mark Buxton, Jul et Mad and ethereal Italian brand Menditorrosa, alongside the more ‘usual’ names, the beauty hall is more compact than most London department stores, making shopping here a real pleasure, rather than putting you on sensory overwhelm. Like all their cream-and-black-and-silver boutiques, the Brook Street location offers friendly and knowledgeable service – and the collection’s expanding so fast, a little guidance may not go amiss. And if you’re stumped for a gift? Can we just say that we don’t think there’s anyone alive whose heart wouldn’t thrill to a Jo Malone London Lime, Basil & Mandarin Candle? Before Fortnum & Mason became the elegant department store it is today, co-founder William Fortnum (a footman to the Queen Anne) made candles for the Court’s ladies-in-waiting. 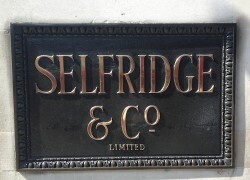 His passion became his enterprise and Fortnum (alongside landlord Hugh Mason) opened their candle store on Duke Street. Fittingly, the recently reopened Candle Room is one of London’s most sense-drenching shopping destinations for lovers of home fragrancing, with Cire Trudon, Lorenzo Villoresi, Kenneth Turner, Roja Dove (he’s created an exclusive Fortnum’s Candle), Tiziano Terenzi, etc. On the third floor, meanwhile, the perfume department is a total treat, including Xerjoff, Clive Christian, Lalique, a stand-alone Caron counter. If you want to leave with a particularly Fortnum-esque souvenir, try Fortnum & Mason 1707, a feminine and pretty blend of ylang-ylang, rose geranium and jasmine. 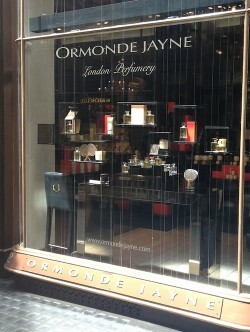 A veritable treasure trove of niche fragrance, Jovoy Mayfair boasts the scents of over 60 niche perfume houses. Stocking sought after and hard to find names like Jeroboam, M.Micallef, The Different Company, House of Oud, as well as their own scents. A true ‘phoenix’ story: Jovoy, a revered house from the 1920s, was restored by founder François Hénin. A renowned perfumery in Paris, we couldn’t be gladder that François chose London as another home for Jovoy: a place where the incredibly knowledgeable staff have no problem guiding you, with ease, through the shelves of scented delights. Just behind Fortnum’s, find Floris, who’ve been selling fine fragrances on Jermyn Street since 1730, earning many royal patents (and fans like Marilyn Monroe, who loved the Rose Geranium Bath Oil). Staying true to tradition while keeping a finger on the pulse of the fashionable world, Floris offer heritage scents alongside contemporary creations like sun-drenched Soullé Ambar and breezy Cefiro, showcased in historic mahogany cabinets and counters from The Great Exhibition. founded in 2001, resident here since 2006. The interioroozes luxury with a palette of sleek black, gold and bright orange, and the ‘bento box style’ wall displays a decadent collection of perfumes, candles and gift boxes based on Ormonde Jayne’s 18 opulent scents, including Orris Noir, Frangipani, Osmanthus – and the Four Corners of the Earth collection of travel-inspired scents. Early in the week, you may find yourself greeted by founder Linda Pilkington, who’s travelled the world to find rare ingredients like linden blossom, tiaré and a particularly rare oudh. If you’re feeling the urge to self-indulge, Gold Dust – a 24 carat gold dusting powder scented with Ta’If Rose – is a lavish buy, worth every speck of its golden contents. A sliver of a shop in the heart of Mayfair, this is one of London’s most beautifully-presented perfumeries, which always makes us feel slightly like we’re walking through the wardrobe door into Narnia. The displays are unconventional (and enticing): a selection of the fragrances is presented on a beautiful claw-footed dressing table, for instance, for delicious browsing. (Things of beauty are not in short supply here.) It’s easy to shop without interruption or pressure to buy; Marta, one of Avery’s brand specialists, told us: ‘We want you to focus on the “juice”, and to be seduced by your own olfactory senses.’ Showcased collections include Blood Concept, Boadicea the Victorious, Agonist’s collectible hand-blown ‘Sculpture Line’, Andrea Maack and other niche and interesting lines. South Molton Street is a mini epicentre for glamour, fashion and art – and Browns Focus is the arena for top emerging designer brands and fashion exclusives. Browns specialise in all things that are ‘hot right now’, and their selection of perfume is no exception: an edited collection of modern fragrances which changes with the season. When we visited we encountered Liaison de Parfum, an edit of the Commes de Garçons perfumes, Escentric Molecules and Heeley, among others. Selfridges’ signature yellow bags are as unmissable as the flagship store on Oxford Street. Across Selfridges; five floors you can find anything from a tattoo parlour to psychic advice – but enter from the central Regent Street door andyou’ll find yourself immediately in the Perfume Hall (it hasn’t moved since the store opened in 1910, with what’s regarded as the world’s first beauty hall). 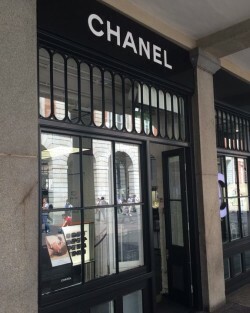 Dior, Chanel, Armani and Tom Ford dominate the Perfume Hall’s four corners, with their own boutiques offering a 360-degree brand experience, at your leisure (often with a glass of Champagne – and generally with no need to book). Think of a fragrance and it’s probably sold here, but rarer ‘finds’ include Amouage, Juliette Has a Gun, SoOud, and bestselling Bella Bellissima line, which goes down a storm with summer’s Middle Eastern customers. 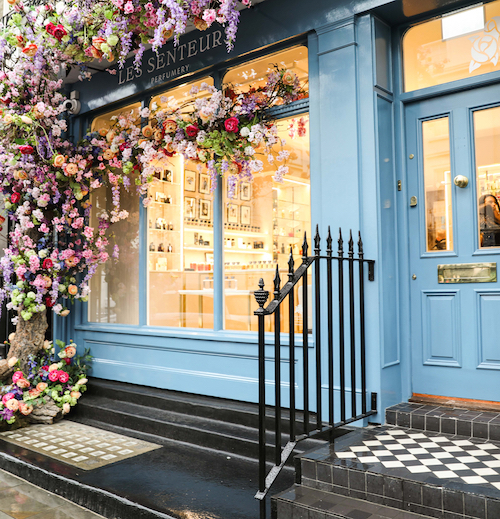 ‘The promised land for fine fragrances in London’ is how we think of Les Senteurs. Family-run since it opened in 1984, this beautiful boutique is bursting with hard-to-find names. 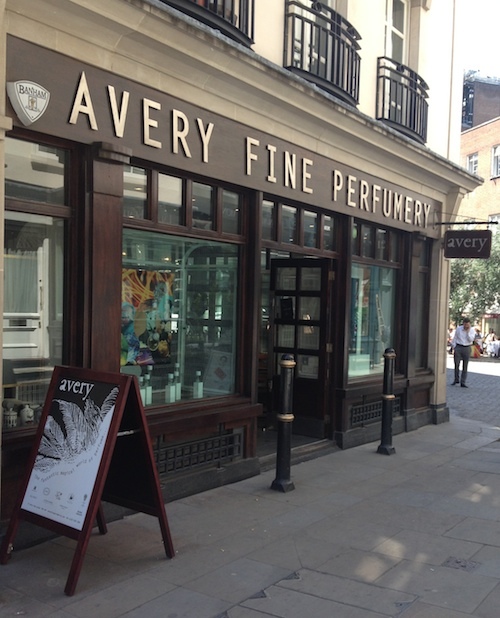 Les Senteurs hosts events with perfumery’s finest names (think: Andy Tauer, Tom Daxon etc.) 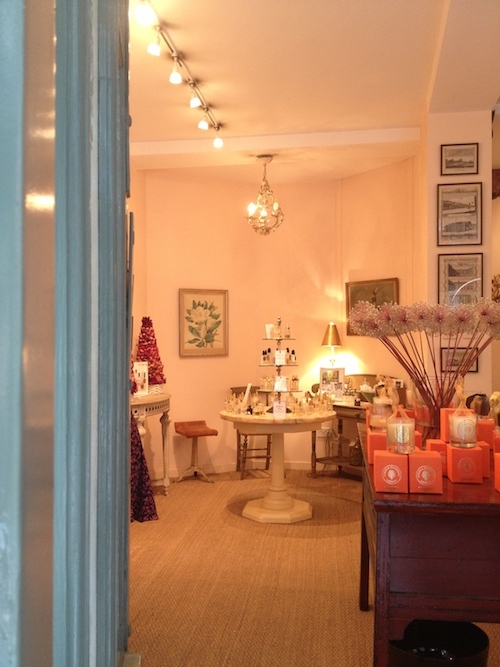 and as London’s oldest independently-run perfumery, it is a haven for all perfumistas. A place for true olfactory adventures, Les Senteurs has been the introductory stockist for a lengthy roll-call of fragrance names. The range today includes Frederic Malle Éditions de Parfums, Maison Francis Kurkdjian, Galway-based Cloon Keen, Heeley, By Kilian and all sorts of ‘newness’. 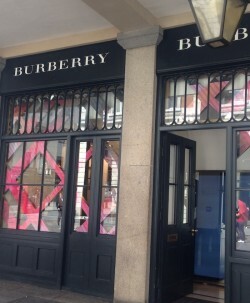 71 Elizabeth Street, Belgravia, SW1W 9PJ. ‘Rising stars’ of the perfume world, Shay & Blue’s the ‘baby’ of fragrance industry veteran (he’ll kill us for saying that) Dominic De Vetta, who’s working in tandem with ‘nose’ Julie Massé to create a dynamic new fragrance house which nevertheless channels the true traditions of perfumery. The collection of eight (and counting) scents feature many ingredients grown in Grasse, still acknowledged as supplying the highest-quality raw materials in the world. Bestsellers include tangy, juicily inviting Blood Oranges and headily arm Oriental Atropa Belladonna – but do indulge in a spritz of S&B’s debut ‘gourmand’ scent, Salt Caramel (eerily like a Charbonnel & Walker truffle. In a good way.) This flagship store in Old Marylebone feels a little like a (more welcoming) gentleman’s club, kitted out with tasteful objects, antique cabinetry, with everything pleasingly packaged in smart blue boxes tied with stripe-y ribbon. Penhaligon’s stores are fabulous places to get lost and linger, with that old- world, apothecary feel that they’ve nailed so well; every store is a piece of ‘fragrant theatre’ (and every store is different). 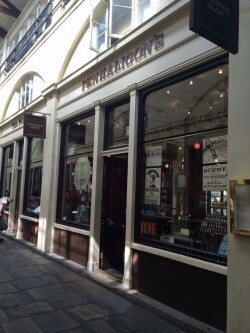 What’s wonderful about this store in particular is that if you burrow your way down the windy steps you will find a back catalogue of Penhaligon‘s history, masterly put together by Nick Gilbert – the absurdly knowledgeable ambassador for the brand. Once you have finished marvelling at this, you can have a seat behind the red velvet curtains and enjoy a one to one consultation to find your perfect perfume via a range of questions spanning ‘what are your preferred evenings activities?’ to ‘what’s your favourite fabric?’, to help establish which Penhaligon’s scent is yours. Not only is it really great fun; it truly works! house’s absolute pride and joy. Their welcoming staff invite you to take your time and mooch, while there are screens everywhere allowing you to ‘try’ the products before you put them on your skin (we particularly enjoyed the interactive nail varnish style-builders!) 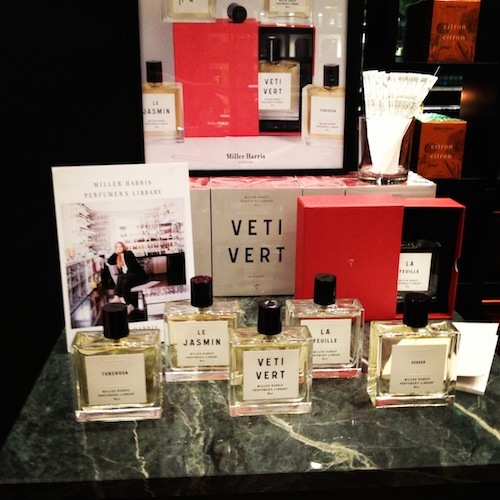 Each of their iconic scents is proudly spotlighted, around the store, for you to play and spray. It’s the 21st approach to boutique fragrance buying. We feel, thanks to Burberry, like we’ve seen the future of beauty shopping – and this is it. Hop right next door to Dior: a sleek, simple, and bright boutique which really needs do nothing more to excite us than proudly place their heritage scents on display, for exploring. 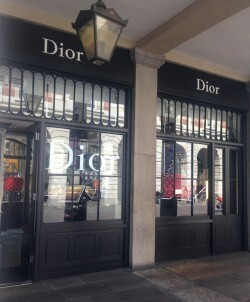 This store has bought the term ‘fragrance wardrobe’ to its most literal meaning: if you can’t find a fresh bottle of your signature Dior scent, just ask and you’ll be directed to one of the shiny drawers – then glide it open, and your fragrance will there to behold. Do set aside enough time to dip, dab and spray to your heart’s (and your nose’s) content. decorated with super-sized bottles of scent, there are plenty of ‘exclusives’ here: a Bridal Beauty Service through which you can be matched with your ideal wedding fragrance, special edition beauty products (many only otherwise found abroad), and harder-to-find fragrances, this isn’t a shop: it’s a treasure trove of perfumed discoveries. 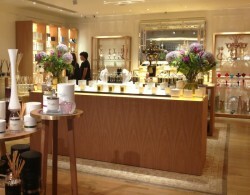 Miller Harris’s new retail concept – now being rolled out worldwide – began life here, and featuring a sophisticated rainbow of boxes and bottles of fragrance from wall to wall, the Miller Harris boutique is a hub of sensuous delights. Sited in the heart of the Piazza, the perfume house took inspiration from the Square’s flower market past – indeed, the boutique even launched an exclusive scent Le Fleur du Matin which was inspired by the glorious bouquets once sold there. 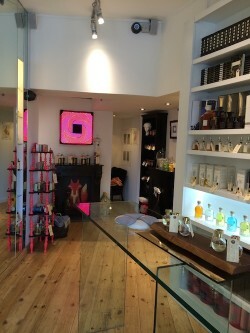 Fabulous fragrances, divine candles, smiling staff. What’s not to love? This Artillery Passage boutique is Angela’s flagship store, though her brand was born on Columbia Road (the original branch is a must-visit fragrance destination on a Sunday, not least for the vibrant flower market!) On an Oliver Twist-esque cobbled passage just of Spitalfields Market, it was here in 1852 that John Bush, an ingredient supplier to East London and the City, opened a business selling perfume supplies before later expanding with lavender factories and distilleries in Hackney and Mitcham. As Angela says, ‘No. 4 is a particularly pretty shop and when it became available I was unable to resist the temptation to introduce my perfumes to Spitalfields and the City, and participate in its proud perfumery tradition’. Enjoy wonderful floral displays in the window, reminiscent of the brands beginnings – then step inside and you feel like you’ve walked into Angela’s home. It’s blushing with warm neutrals, peach tones and sisal carpets and you’re immediately greeted with the glorious rose scents of her signature candles. Each of fragrances Angela has created is proudly merchandised with perfect unity, as virtually every bottle is the same. Set aside hours, and sniff every one. A quirkily-shaped shop in too-cool-for-school Shoreditch, run by a Russian scent connoisseur with a ‘nose’ for interesting niche brands. Where brands don’t supply samples, they’ll happily decant them into general trial vials (£2 a pop), since Oxana shares our belief that you should ‘try before you buy’. Even we encountered brands we’d never tried before (in particular, the fabulous Spanish Carner fragrances), beside Arquiste, Phaedon, Parfumerie Générale, Nasomatto, Olfactive Studio, Jovoy, Vero.Profumo. – it’s quite some list. We’re loving the green-and-white-striped sweetie bags in place of rustling tissue: very Shoreditch, those. A big selection of candles (Cire Trudon, Parfums d’Écrivains, Jovoy and Phaedon again, plus Claus Porto’s irresistibly-packaged luxury soaps.